Chris has gone from being a regular visitor at Grandview Court, to becoming an integral part of its café service. 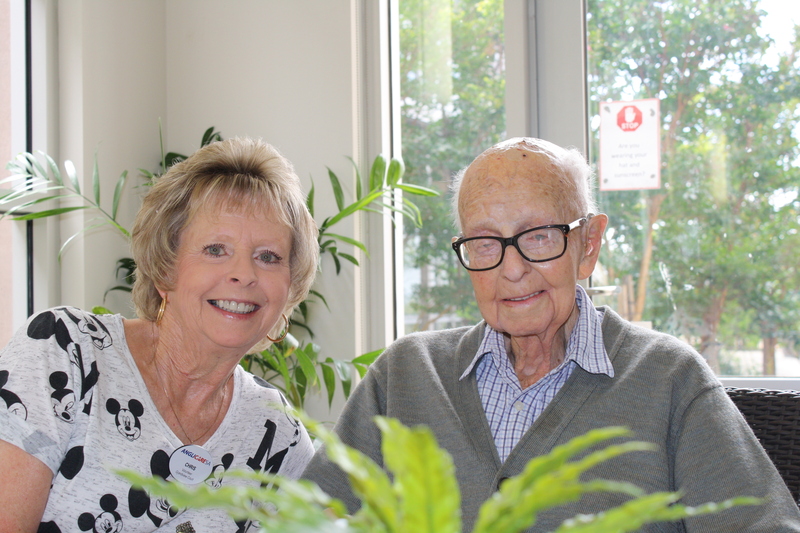 Chris’s 95 year old father, John, has been a resident at AnglicareSA’s Residential Care Facility in Trott Park for two and a half years. Chris is at Grandview Court several days a week visiting her dad. “I noticed how busy the café would get and offered to volunteer my time to help them out,” Chris said. “That was more than 18 months ago. Now I volunteer each Tuesday – and sometimes an extra day during the week if they need an extra hand. “I’ve made friends with staff and residents alike. I love to be a companion for older people and cherish the opportunity to put a smile on their faces. AnglicareSA staff are grateful for Chris’s valuable assistance. Volunteers are a vital part of the services and support provided by AnglicareSA to the South Australian community. Chris didn’t have a hospitality background. But that didn’t matter. After raising two sons, working as a nurse’s assistant, being an office administrator and an aged care worker, she brought plenty of useful skills and a warm personality to her café volunteer role. AnglicareSA’s aged care facility cafés are happy places where residents and their families and friends can gather for a laugh, a chat and a coffee. “I’d love to see the café open on weekends but I know we need more volunteers to make that happen,” Chris said. A number of AnglicareSA’s Residential Aged Care facilities need café volunteers. Work includes making coffee, serving food and clearing tables, as well as taking the time to chat and connect with residents and their family and friends. You’ll acquire skills and experience in a hospitality environment – and you’ll probably also make friends and enjoy yourself! If you love caring for older South Australians like we do, please call to discuss this opportunity. Please contact Alycia Galbraith on 08 8305 9251 or email at [email protected] or click here.